The attractive Baby Looney Tunes Bibs are available in beautiful embroidery. Vogue Sourcing offer wide variety of Baby Bib, Baby Disposable Bib, Toddler Bibs, Kids Bib that makes the babies comfortable. These bibs are manufactured and exported to various countries. Bibs are available in various sizes, design and colors. Made with extra care so that it not hurt the child and it is comfortable to wear. Made from super fine absorbent cotton, these cotton bibs are designed and made for easy feeding. 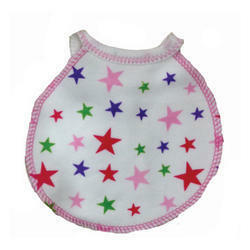 We have stitched these cotton bibs in variety of shapes and designs to suit the different requirements of the kids. The exuberant color combinations of these bibs attract the child also. 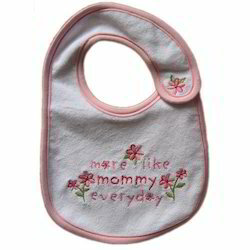 Baby Bib offered is engineered using best available techniques and following international industrial standard. - Made of Food Grade Silicone; Baby bibs are super soft on babies’ neck and body. 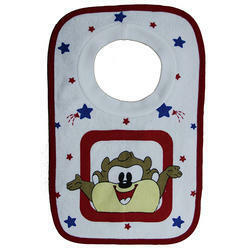 Manufacturer & Supplier of Baby Bibs & Cotton Baby Bibs. Our product range also comprises of Baby Rompers, Baby Bath Towels and Baby Vests. 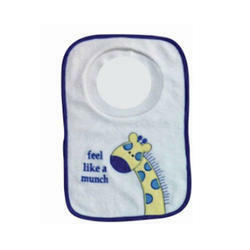 With our expertise and trustworthiness, we are engaged in manufacturing an optimum quality range of Stylish Baby Bibs. For catering the variegated demands of our respected clients, we are highly engrossed in providing a wide range of Baby Bib.